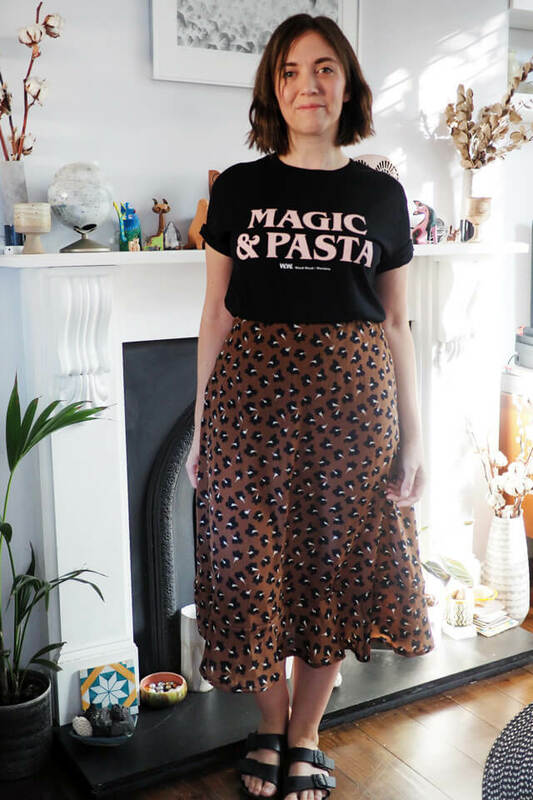 This garment was definitely swayed by seasonal trends I’m seeing in the shops and online, probably more so than most of the stuff I usually make. 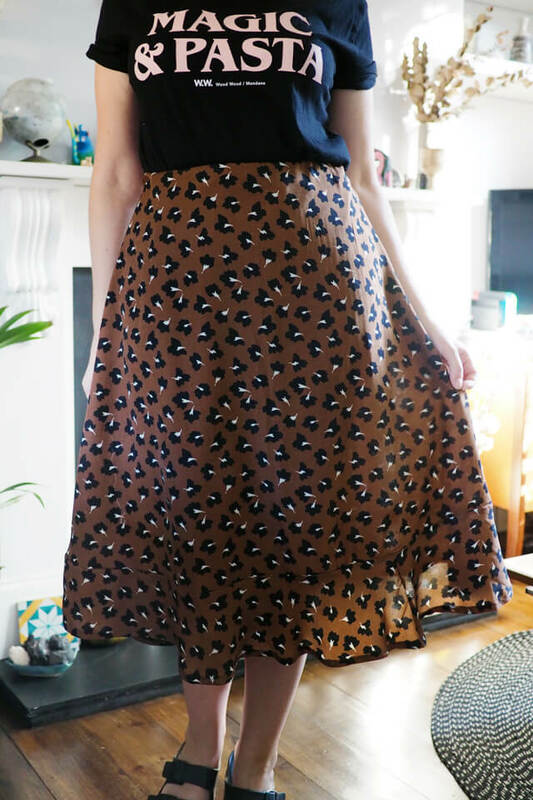 Midi, ruffles, and a print that almost reads as leopard-like, a trend I have definitely not dipped into before. But I likey and, toned down a little to suit my own taste, it’s surprisingly wearable! 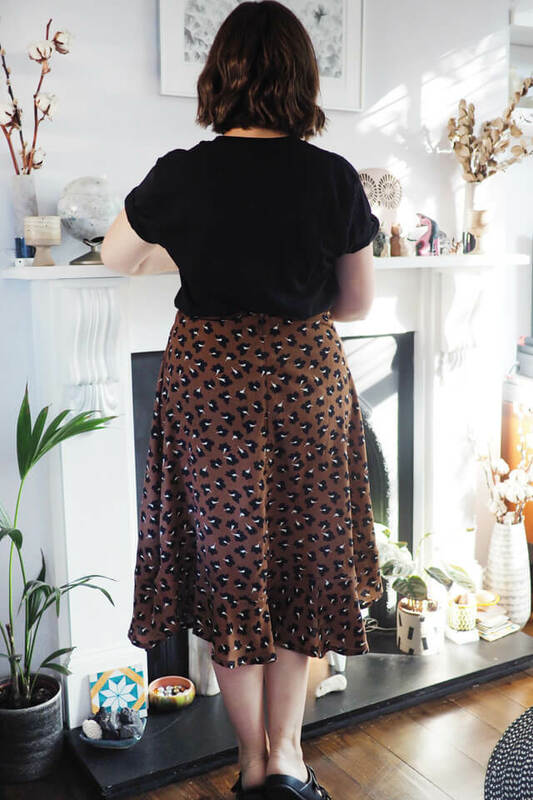 I used the Tilly & the Buttons Seren skirt as a basis, which is basically a knee length half circle skirt – you could use BHL’s calculator to self-draft. 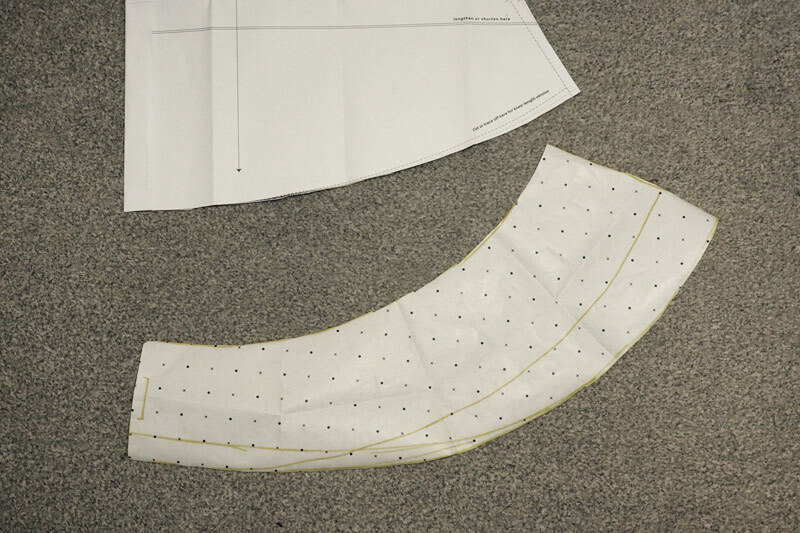 At the hem I drafted a separate flounce by extending the hem down then slash-and-spreading to add curvy fullness. I pretty much eyeballed the amount I was adding and the end result is not extremely poofy, but as a ruffle/flounce newbie with already quite a bold print for my taste, I think it adds just the right amount of kickiness. Finally I also made the length of the flounce asymmetric, which again is quite subtle but gives a bit of extra interest to the swishy hem. To finish the waistline I took a tip from m’favourite McCall 7445 and drafted a facing rather than adding a waistband. 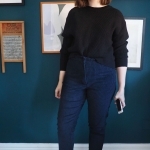 I find this really comfortable, flattering and easy to fit as you can fine-tune to make it as snug as you like by adjusting the side seams, and there’s no risk of the typical gaping you might get when adding a waistband. 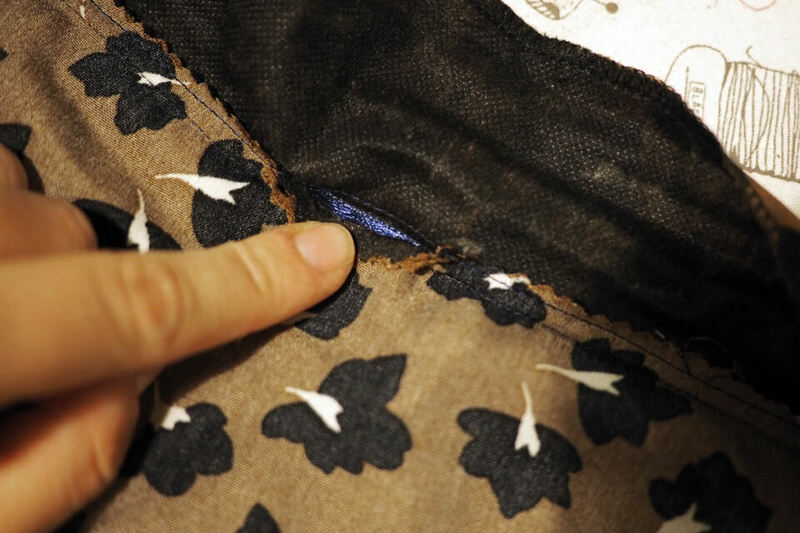 I added thin ribbon into the seam to act as a stay and prevent stretching out over time. The little ribbons you get attached to tops sometimes are handy to cut out and keep for this purpose! It’s still comfortable as the ribbon is so narrow it doesn’t dig in. 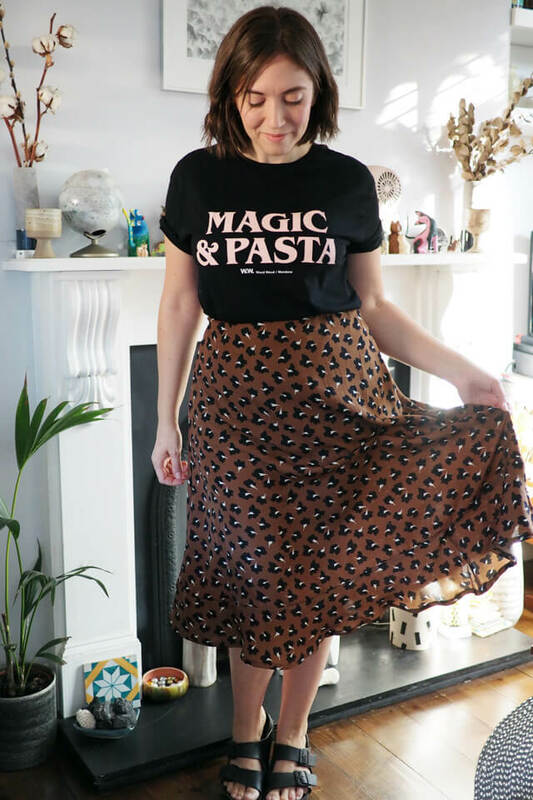 It fills a real wardrobe gap for these in-betweeny days and lets me pair my rotation of silly slogan t-shirts with a slightly more polished bottom half, a look I am quite into for work. It was a super fast-gratification and stash-busting sew (I can’t even remember the fabric source, it’s been kicking around for so long! 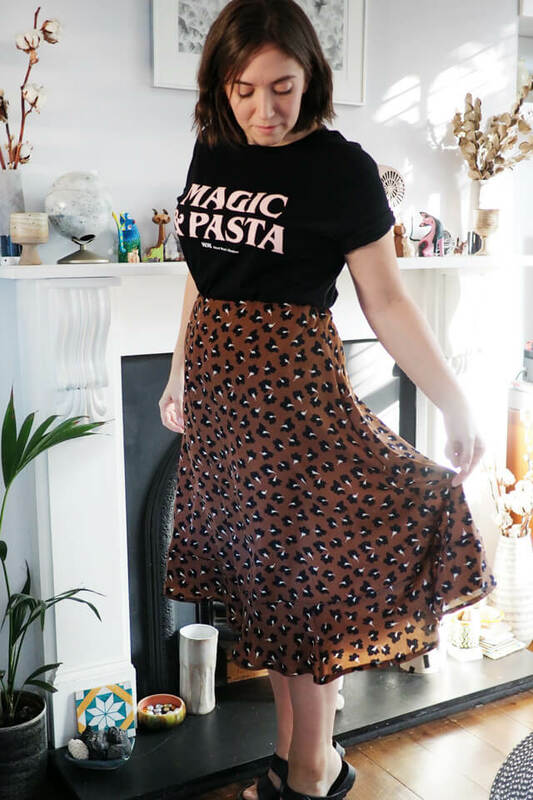 ), so I expect I may make a couple more as I think it will also work well with tights come the inevitable post-Birkenstocks-and-bare-legs weather. 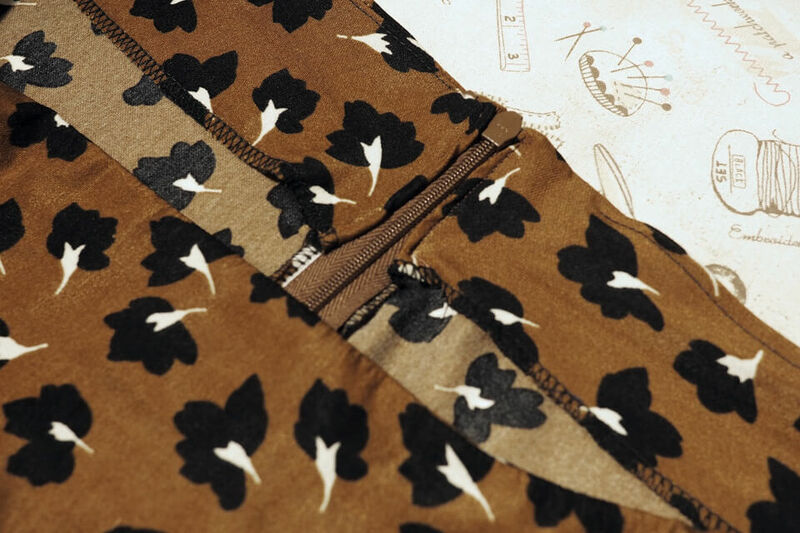 Please tell us where this gorgeous fabric is from??? 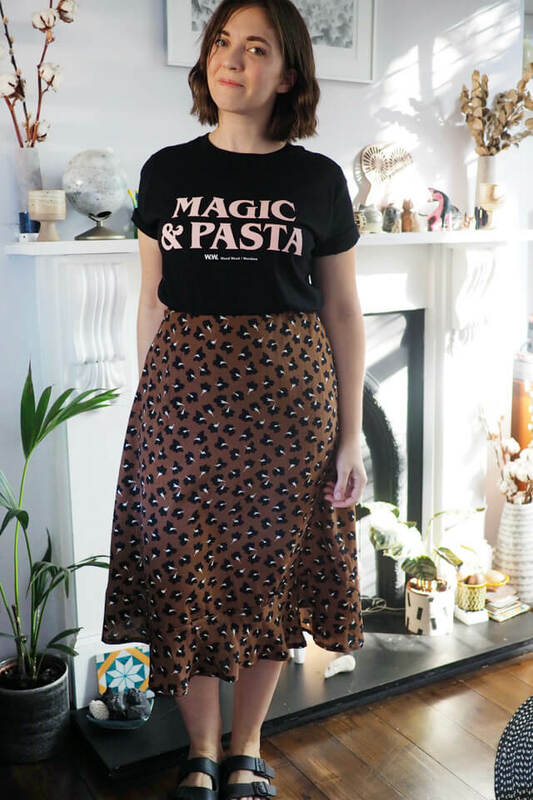 I’m in love with this outfit, silly slogan tee included obviously! I’m afraid it was from the depths of my stash and I can’t remember where it was from originally, I think it was an eBay or fabric store remnant. A lucky find! What a beautiful skirt! I love the idea of marrying a more trendy style with the handmade approach. Love the style of this skirt. Im quite new to seeing but may try something like this for sure. General question, but how much fabric do you buy when you don’t have a particular pattern in mind? Thinking I want to add to my stash but not sure how much to get. This is looking awesome Katie. I am loving your work. Very creative.